Claremont Lodge help raise money for the Philippines Disaster via OXFAM. The residents of Claremont Lodge a nursing home near Arundel and Chichester, have raised nearly £1,000 for Oxfam’s Philippines appeal after being moved by the news coverage of the tragedy. Typhoon Haiyan tore a path of destruction over 100 miles wide through the central Philippines after making landfall in November last year. Roma Wood, the home’s registered Manager said ,“The residents watched the news coverage and were so moved by what they saw, they felt compelled to try and do something to help”. Russell Wilson, Managing Director of Royal Bay Care Homes said, "I heard about the valiant efforts being put in by the everyone at Claremont lodge to support the appeal and thought it deserved our support which is why we were happy to match the amount raised." 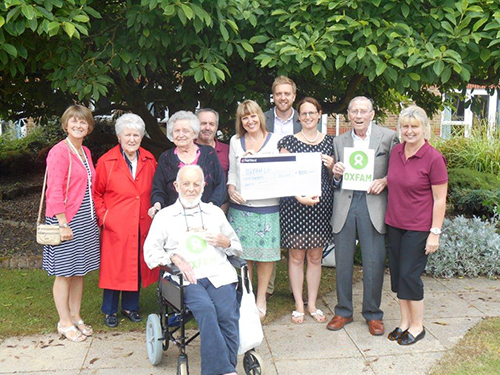 Ben Ansell, Senior Community Fundraising Manager for Oxfam in the South East came this week to receive the cheque and said “We were so touched by the residents fundraising for our appeal. Oxfam has reached more than 780,000 people with life-saving support and is now helping people to earn a living again, for example providing farmers with seeds, repairing fishing boats and helping families to resettle”. Claremont Lodge often organises fund raising events for various causes throughout the year, with the emphasis on residents’ activity involving the local community, as well as families and friends.